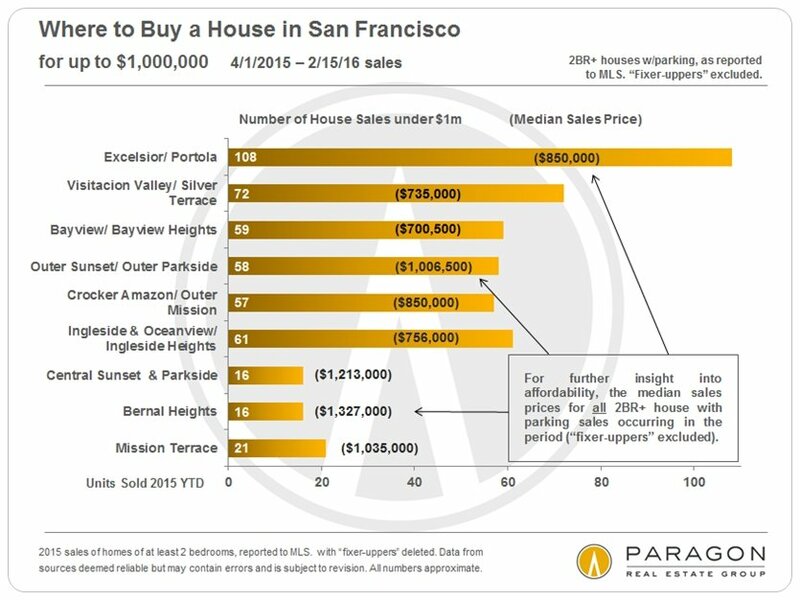 Previously we started dissecting Paragon’s report on affordability by San Francisco neighborhood. Today we’re going to conclude that conversation by talking about slightly more expensive homes in the city. 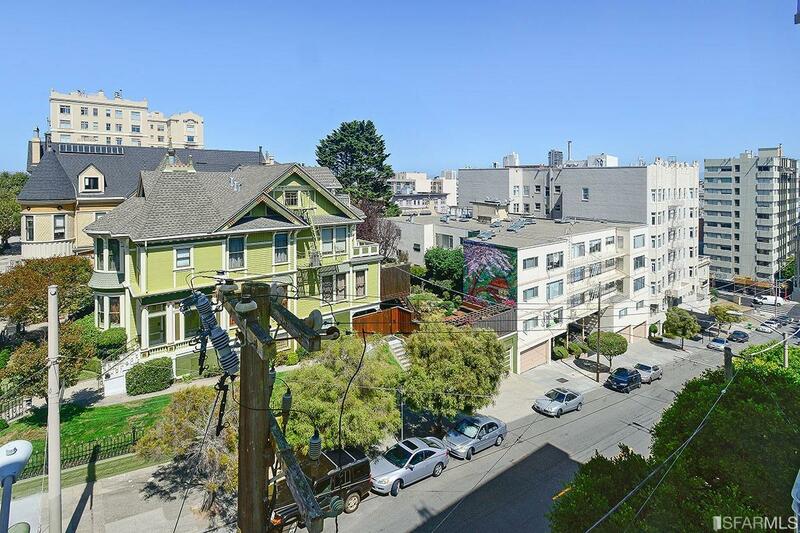 If you’re looking to spend $1 million to $1.5 million, you’ll find prospects in the west and central-south parts of the city, including Central Sunset and Parkside, Golden Gate Heights, Miraloma Park, Sunnyside, Bernal Heights and Mission Terrace. As the report notes, the past two years have seen quite a bit of upward pressure on these areas. You’ll find most condo and co-op sales in this price range around the areas including South Beach, Inner Mission, Hayes Valley, Dogpatch and South of Market, as well as in more high-end neighborhoods such as Pacific Heights, Russian Hill and the greater Noe-Eureka Valleys area. This is largely thanks to the arrival of newer condo developments that have surged onto the market over the past decade to decade and a half. Now let’s get down to the higher figures — $2 million to $2.5 million. When you get up here, the market becomes dominated by the greater Noe-Eureka-Cole Valleys district, the St. Francis Wood-Forest Hill district, the Potrero Hill-Inner Mission area, and the Inner-Central Richmond and Lake Street area. Then there’s the luxury market, otherwise known as homes selling for $2.5 million and above and condos, co-ops and TICs selling for $1.5 and above. 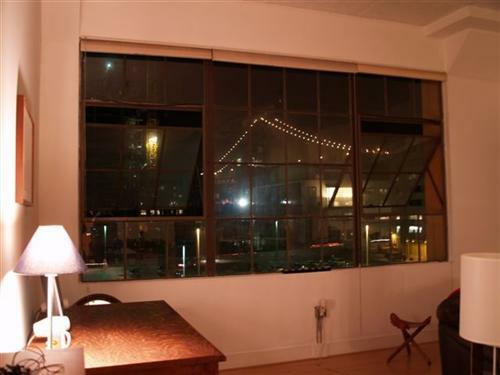 (This is San Francisco, which is not necessarily your father’s luxury market.) These millions play differently depending on neighborhood. Factors that play significant roles include views, which are particularly important in the luxury condo market. The ultra-high end in the city is dominated by the northern neighborhoods such as Pacific Heights, where you’ll see houses selling for $5 million and above. You’ll find the most luxury condo sales in the greater South Beach-Yerba Buena area. For prevailing SF median house and condo prices, Paragon’s interactive map of neighborhood values can be found here: SF Neighborhood Home-Price Map. 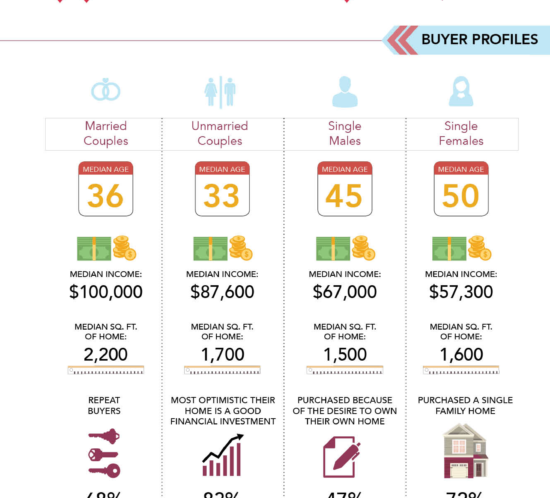 In this place of low inventory and time of skyrocketing prices, what can be said about buying a home for the price you’re seeking to spend? Well, Paragon’s put a few thoughts together in its report on affordability by San Francisco neighborhood. 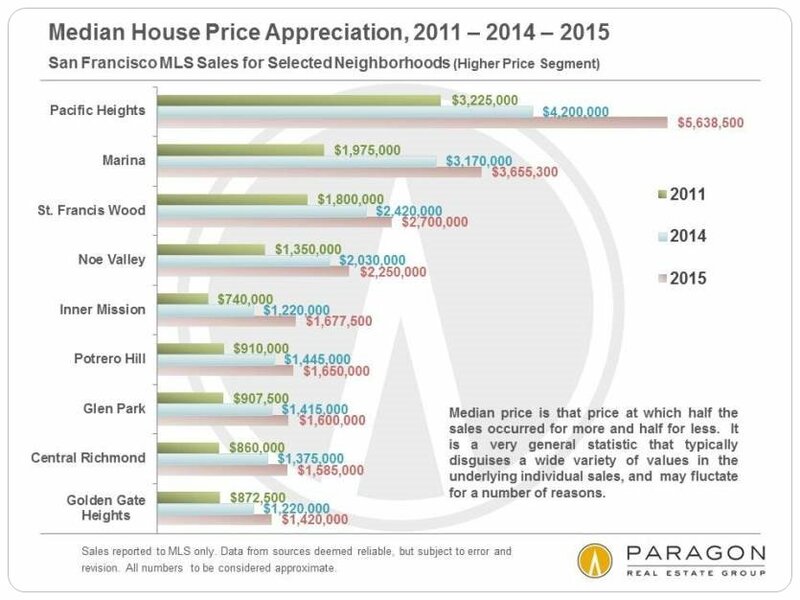 The chart that accompanies this post, in addition to all other charts in the report, are based on San Francisco home sales reported to the Multiple Listing Service in the 10 to 12 months through Feb. 15, 2016, delineating the neighborhoods with the most sales within given price points. Other neighborhoods that aren’t listed did have smaller numbers of sales within given price segments. First, let’s look at where to buy a single-family house for under $1 million. Since the overall median house price in the city in the fourth quarter of 2015 was $1.25 million, this segment is growing increasingly less common. Here you’ll typically find a large swath of neighborhoods running along the southern border of the city, which Paragon notes are by far its most affordable markets. These include the Bayview, Portola, Excelsior and Crocker-Amazon districts. Looking at the horizontal columns, you’ll see the number of sales of houses with at least two bedrooms, with parking, for less than $1 million, while the median sales prices noted are all for two-bedroom homes during that period. Now let’s turn to condos, co-ops and tenancies in common for less than $1 million. In the fourth quarter of 2015, the overall San Francisco median condo price was about $1.1 million, with sales under $1 million still taking place in almost every area of the city that features these types of properties. That said, a studio unit in Russian Hill may run you about as much as a two-bedroom condo in Diamond Heights. Amongst these property types, condos predominate (90 percent), with stock co-cop apartments only constituting 1 to 2 percent and TICs making up the balance. The Paragon report notes that the latter typically sells at a significant discount as compared to other properties. Tune in tomorrow for more on this report. Do you believe in what you can’t see? When it comes to the pocket-listing market in San Francisco, there’s plenty of reason to believe. 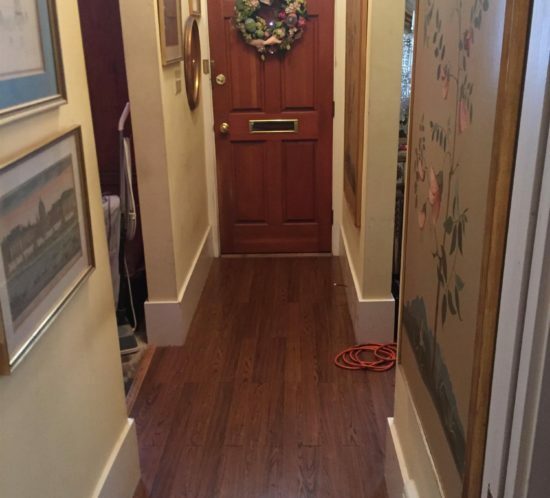 That’s according to PocketList, which (via Curbed) estimates that nearly a quarter of the homes sold here in the City by the Bay are done so privately – without ever so much as hitting the Multiple Listing Service or undergoing any public marketing efforts. This is based on a study that takes its results from data from the City Assessors Office. According to those figures, private sales generated approximately $2 billion in 2014 alone. While many sellers seek to cast a wide net when it comes to getting their property seen by a lot of eyes, that’s not always the case, PocketList CEO Tom MacLeod told Curbed. In other findings, the study asserts that private sales are often higher-value sales, generating prices that were 7.6 percent higher than average in 2014 and 1.5 percent higher in 2015. In addition, it also found that the highest prices for such private sales occurred in the first quarter, from January to April. 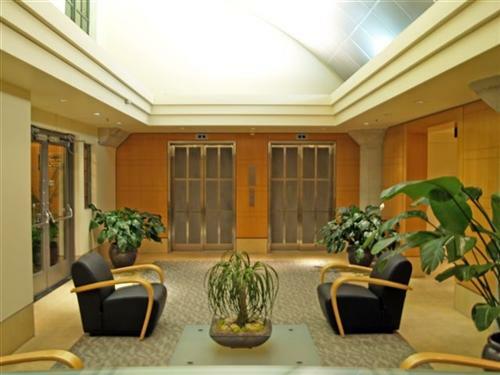 Want to learn more about the private market in the city? Give me a call or send me an email. SocketSite reports that there are plans in the works for a 13-story building to be built at 1028 Market Street, a project that would entail 186 apartments set over four ground-floor restaurant and retail spaces plus a basement garage for just over 40 cars. It is spearheaded by designer Solomon Cordwell Buenz. However, should the project be approved, it is subject to an estimated timeline of 20 months and a budget of $60 million to take it to completion. 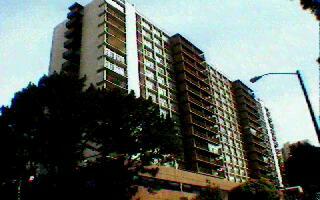 That includes a three-week span of work to demolish the Golden Gate Building. There would be pedestrian access from Golden Gate Avenue along with access to the garage and a retail space. According to a Preliminary Project Assessment produced by the city Planning Department in 2014, the approvals necessary to proceed with the project include downtown project authorization, conditional use authorization, building permit application and variance, and in accordance with the Guidelines for Downtown Open Space, must offer one square foot of public open space for every 50 square feet of retail. Are we seeing prefab construction in the city? The panel, which featured Ken Lowney of Lowney Architecture, Taeko Takagi of Zeta Communities, Blair Allison of Cahill Contractors and Patrick Kennedy of Panoramic Interests, raised questions with regard to the future of modular construction. According to Lowney, a prefab project requires that most vital questions be answered before significant progress is made – but that a successfully coordinated partnership promises major rewards by the end. 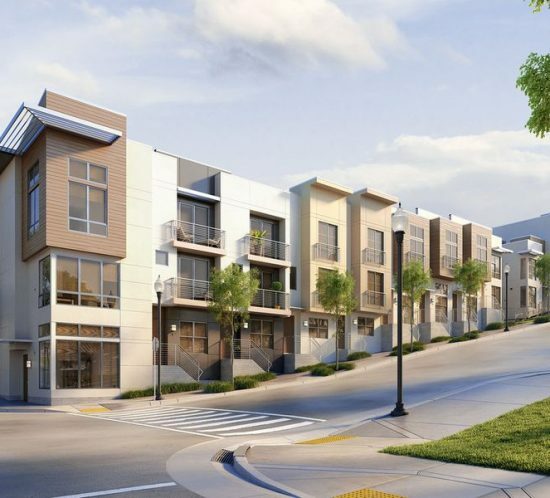 He cited a 1380-unit project he designed in the Bayview, for which the hard costs were slashed 20 percent and the project delivered in half the time as compared to typical on-site development. Takagi added that prefab benefits include shortened timelines, reduced construction budgets and a quality end product, with other less obvious benefits including a safer work environment and a greater diversity of gender and age on the manufacturing floor. She called for improvements vis-à-vis greater practice – in other words, prefab may be here to stay. Residential real estate in San Francisco hit major highs at the end of 2015, according to Paragon data as reported in the Marina Times. The city saw its median house sales price increase to $1.25 million, up about $125,000 from a year earlier, though it was down about $75,000 from the second quarter 2015’s peak. Meanwhile, median sales prices for condominiums went up by an equivalent amount — $130,000 – according to Paragon data. The firm found that the median condo price was $1.125 million as of year-end 2015. Paragon notes that throughout California, the median sales price for existing homes was $476,000 as of September 2015, while nationally the comparable price was $220,000 as of October 2015. Now let’s turn to the price of renting in the city. The Marina Times article reports – via Priceonomics.com – that in mid-2015, the median monthly rental in San Francisco was $3,452 for a one-bedroom apartment, $4,400 for a two-bedroom place and $5,215 for a three-bedroom. Additionally, Rentjungle.com notes that apartment rentals within 10 miles of the city averaged $3,457, with one-bedrooms priced at $2,896 monthly. Curbed SF recently cited Paragon research in an article titled “Breaking Down SF’s Scary Price Increases by Neighborhood.” Specifically, the post addressed the data dating back to 2011 as discussed previously here. In 2011, for example, median single-family home prices weren’t exactly a bargain in Pacific Heights — $3.225 million, to be specific – but now that figure has jumped to $5.6385 million. That, Curbed notes, is the city’s largest raw increase. But as you’ll see by the chart that accompanies this post, the city is home to many such crazy increases. 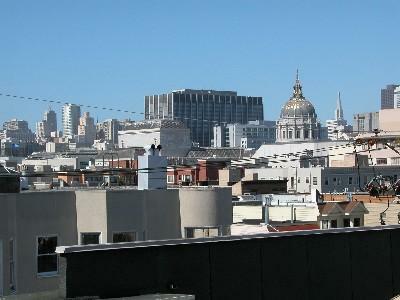 For example, house prices in the Mission have seen the median more than double from $740,000 to $1.677 million. Then there’s the Marina, where prices have increased from a $1.975 median to $3.6653 – a whopping 85 percent jump in just four years. In Noe Valley, we’ve seen the median rise from $1.35 million to $2.25 million – a 67 percent increase – and in the Central Richmond, median prices have risen from $860,000 to $1.585 million, an 84 percent jump. And in the Bayview, we’ve seen a more-than-100-percent increase between 2011 and now, going from $300,000 to $670,000, and the Outer Richmond has also seen a huge rise — $680,000 to $1.295 million. Curbed also notes that Paragon research finds that condo prices are on the rise as well, with Russian Hill seeing nearly 100 percent in increases since 2011, from $872,500 to $1.65 million and trailed closely by NoPa and the Mission. While you can still find relative bargains in Diamond Heights, the median price has still seen an increase of 93 percent from $352,000 to $680,000.